Music reviews are typically descriptive, but because words never adequately describe music, I rarely review music recordings. 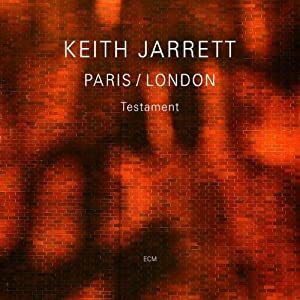 Nonetheless, for Keith Jarrett’s 2008 album Paris / London: Testament I’ve made this exception. People who know me are aware that I have long regarded Keith Jarrett to be my favorite musician of any genre currently walking around on planet Earth. I’ve heard most of his recorded output since the time he worked with Charles Lloyd in the late sixties. It’s not my habit to make a big deal of this in front of others, but I own thirty-eight of Keith Jarrett’s albums on CD, and another twenty on vinyl. That count is in titles; half or more are multi-disk combinations. Among these are work from almost every genre he has worked in, including small group and trio jazz, classical composition, and many of his excellent classical music recordings. It’s not difficult to argue that the form of expression in which Keith Jarrett has made his lasting mark is in solo piano improvisation, in studio albums, and moreso in live concerts, where he subjects himself to walking on a musical high-wire without a net, creating everything new the moment he sits down at the piano. Could even Bach or Mozart improvise as well in their own days and in their own ways? Perhaps they could, but even if so, as an improviser Keith Jarrett surely belongs in the same echelon. Today we enjoy the luxury of being able to record Jarrett’s improvisations, after which we can listen to them as often as we wish. Personally, I listen to a vast range of music, but never tire of hearing Keith Jarrett’s solo recordings. In 1994 I wrote a longish biographical sketch of Keith Jarrett for my nascent website. It contained little personal research, and consisted largely of a combination of points I had picked up from personal experience, plus what I had learned from Ian Carr’s 1992 biography of Jarrett (now greatly out of date). For two or three years this article attracted enough readers that it was a rare week when I did not receive a half dozen e-mail comments and questions about the subject matter. Because of that biography, for about three years I had the pleasure of carrying on a regular correspondence with Keith Jarrett’s mother, Irma Jarrett. She wrote to me herself, first to compliment me on the article (aw, shucks! ), saying it was “mostly correct,” except for a few details regarding Keith’s early life, and to express her relief that the tone of what I had written was not “over the top,” in the manner that some sycophantically worshipful admirers have been inclined to pen about Jarrett, and to whom he is viewed as a godlike hero. Irma (who invited me to address her by her first name) also promised to correct some misstatements and fill in some missing details, but in the time we corresponded she never got around to doing that, and I did not feel it was appropriate to press her on the matter. Delighted to hear from her, I assured her at the time that I would never abuse the fact that I’d made her acquaintance to probe her for information that was none of my business, nor would I share publicly anything she told me in confidence, a promise that I stuck to. As any good mother would, she refused to say that she thinks any more highly of her most famous son than she does of any of his less well-known younger brothers; she is very proud of each one, and would write enthusiastically about each one. One day I was delighted to receive from Irma Jarrett a self-printed book of poems she had written. It remained visible in my home office for the rest of the years I lived in Phoenix. Eventually our discourse tapered and I lost track of Irma Jarrett. I have not heard from her since October 2003, nor attempted to contact her since then, and do not know if she is even still living. If so, she would be in her mid-eighties by now. I’ve included the previous information as background in order to impress upon readers that my acquaintance with Keith Jarrett’s music is more than a passing fancy, and is something that has played a meaningful role during most of my adult life. Despite this, I have never yet been able to hear Keith Jarrett perform live. Thank goodness we have his recordings to revel in. Jarrett began his solo career in 1971 with the landmark solo studio album on ECM Facing you, still one of my favorite albums of recorded music of all time, in the same league with the best Beatles work. In 1973 Keith Jarrett began performing and recording solo concerts. the first one to be released was the Bremen/Lausane set — a three-disk collection that astounded critics and listeners alike. Since then there have been many more, with a break in the 1990s during which Jarrett stopped performing entirely while he battled chronic fatigue syndrome, which Jarrett claimed may have been brought on in part by the extreme stress of playing solo concerts. Happily, Jarrett has been back to playing a more reasonable schedule of concerts for well over a decade, most with his so-called Standards Trio, now nearly thirty years in existence, along with the occasional solo concert, and continues to grow as a musician and a pianist. When Keith Jarrett first began playing solo concerts, his approach was to play two forty-five-minute sets, each one an uninterrupted excursion, allowing himself to noodle around wherever his muse led him. Any given segment could cover a great deal of musical ground: foot-stomping gospel, be-bop, lyrical ballads, one-chord vamps, quiet meditations, and wild atonality (never in Jarrett’s case mere hand-flailing), including picking and beating around inside the piano. He would conclude each concert with a short encore or two, often of a standard song. One of my favorites is his rendition of Over the Rainbow from his 1995 concert at La Scala in Milan, Italy. I learned a written transcription of this myself, which I play with the care of a Chopin Nocturne. In recent years Jarrett has begun to rethink his approach to solo playing. Now he will let the music stop when it seems appropriate, accept applause, and then start with something new, as if he were performing a series of compositions (or tunes in jazz parlance). In 2008, Keith Jarrett released a three-CD set of concert recordings under the title Paris / London: Testament, which showcases him in new levels of musical maturity and pianistic ability. Jarrett provided a poignantly personal set of liner notes for these recordings. What he writes therein is unquestionably touching. But I wonder if it is fair to read them in advance, thereby letting knowledge of his emotional state at the time influence our impressions? Might it be better to let the music speak for itself first? I’ll say no more about that part of the package so that you as a listener, forewarned, can make your own decision about whether to read the liner notes before or after listening to the music — or to skip them entirely. But the notes do shed some interesting light on the experience. And now, at last, it’s about time to discuss some bits of the music itself. The first thing I notice is how extraordinarily rich the recording of the piano is. Historically, recording a piano, particularly solo, is one of the most difficult feats for sound engineers to accomplish. But Jarrett has teamed up with Manfred Eicher and ECM’s engineers since 1971; in fact, as their primary recording artist, Jarrett has put ECM on the map. Eicher has given Jarrett the freedom to grow as an artist, doing virtually whatever he wants, usually to their mutual benefit. It has been a happy partnership, as in forty years ECM has learned how to record piano, and Jarrett in particular. I can’t detect whether Jarrett uses the same piano in Paris and London, but Jarrett is fanatically fussy about instruments, and given his status and artistic success, it would not surprise me if he is able to move a preferred piano around from place to place. To my ears, the recorded sound in the two concert halls is the same, and it is as good a recording of piano sound as I have ever heard. For this discussion I’ll assume that Jarrett played the same instrument in both concerts. And I know pianos well enough to recognize that it’s a real beauty. It sounds magnificent, thanks in part to its spectacularly bright, and clear tuning. No small part of the sound is Jarrett’s ability to play with all the technique and finesse of the fine classical musician he is, which means not merely his ability to play cascades of notes correctly, but also the depth and shading of the sounds, his dynamic and pedaling control, and ability to balance chords, while playing almost continuously in counterpoint, keeping the individual lines clear. In the liner notes notes Jarrett makes it known that he was seeking to take his solo playing to a higher level, reaching for something new. The results suggest that this means he is now aiming well beyond the mere ability to play and improvise continuously, into the realm of producing what amount to complete compositions on the spot, with the structure of introductions, melodies with chord changes, bridge sections, verses, variations, and endings that make up a cogent whole. The twenty segments that make up the two concerts vary in length from 3:56 to 13:48. They have no titles. Why would they? Created in the moment, they are what they are, therefore without preconceived verbal associations, so they are identified only by the concert location and sequence number. The only parts I will comment on specifically are the last two pieces in London (the second concert), which contrast greatly and make a fitting conclusion to the set. The next-to-last (Part XI: Royal Festival Hall, London) is a highly chromatic but not at all atonal free-form excursion in continuously winding melody accompanied by startlingly original coloristic harmonies. And I particularly delight over the delicious little four-chord flourish that ends it, starting at 7:21. To finish things off (Part XII: Royal Festival Hall, London), Jarrett returns to a type of music he has played before, but that I haven’t heard from him for a long while. He begins with an achingly beautiful tune, not complicated either melodically or harmonically, and develops this into an artfully restrained but full-bodied gospel-style romp. It was a perfect way to end the concert, and doubtless must have brought the crowd in London to their feet. Who could possibly dislike such music? Persons who know little or nothing about Keith Jarrett are often urged to start by listening to his 1975 mega-hit, The Köln Concert, the best-selling jazz album of all time. It was recorded under great duress on a grossly substandard piano. This performance is famous for driving ostinatos and transcendentally pyrotechnical right hand passage work. I’m sure that many fans of Jarrett come to concerts hoping to hear more like that. But Keith Jarrett left that kind of playing behind many years ago. As his ultra-simple albums The Melody at Night, With You (1998) and the recent Jasmine (2010), with bassist Charlie Hayden indicate, Jarrett is utterly unafraid to create albums consisting of simple and familiar songs, with simple chords in quiet and untechnical versions, and releasing them to the world, because to Keith Jarrett the depth of expression always takes precedence over technical artifice. Keith Jarrett is twenty-two months younger than me, and has been a part of my life since I was a young adult. He is playing as well as he ever has. It is my fond hope that he continues to make music of the highest quality for many years to come. This entry was posted in Arts, Music, Re: Views and tagged Charles Lloyd, Keith Jarrett. Bookmark the permalink.